During the first year after planting, fruit and nut trees have different pruning requirements. To ensure a low-profile tree, cut back plum and prune trees to 18 to 20 inches after planting. Cut back cherry and apricot trees to 24 to 32 inches above the graft union; they may be headed back higher if the trees are to be ornamental as well as fruiting trees. Almonds should be headed back to about 30 inches after they are planted. If wide-angled branches are well placed, cut them back to stubs, leaving one or two buds. Cut back peach and nectarine trees to 22 to 24 inches after planting. Peaches may have numerous lateral branches. After topping the tree back, cut the uppermost remaining shoots or branches back to 6 inches. Lower branches should be cut back to 4 to 5 inches. These will be used to select scaffolds during the growing season. Cut off all other branches back to one bud to provide shade for the bark. Peaches and nectarines produce fruit laterally on 1-year-old shoots. It is not uncommon for them to produce fruit the first season after planting. However, avoid allowing fruit to develop in the first two or three years after planting. Cut back walnut trees to promote vigorous shoot growth. 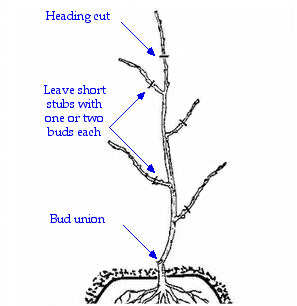 Newly planted trees should be headed back to 4 or 5 buds above the bud union, about 15 to 24 inches from the ground. As the trees begin to grow in spring, the uppermost shoot should be trained up a stake until it reaches 4 to 5 feet. At that point, the leader should be headed back to encourage side branching. The side branches that develop from the headed leader will become the primary scaffold limbs. These should be developed during the first summer growing season. Use care when staking the tree. Tie firmly but recheck occasionally to see that the ties are not too tight, girdling the tree. Fig trees are normally cut back to a height of 24 to 30 inches above the ground after planting. If any side shoots are present after heading, they should be cut back also to a single bud. The young fig trees should be trained to an open center or vase system. Train the scaffold limbs to form a wide angle. Upright scaffolds with narrow angles tend to break or split away as the fruit becomes heavy. After cutting back trees, remove obvious crossing limbs and suckers. Whitewash or paint with diluted interior water-based paint to protect from sunburn and reduce borer damage. Avoid water stress, especially in the first 2 years of development.